Deborah Warner’s new production of Tchaikovsky’s tragic romance, directed by Fiona Shaw, opened the Met’s 2013–14 season. Anna Netrebko stars as Tatiana, the young woman whose impulsive declaration of love is coolly rejected by Mariusz Kwiecien’s Onegin—with unexpected consequences years later. 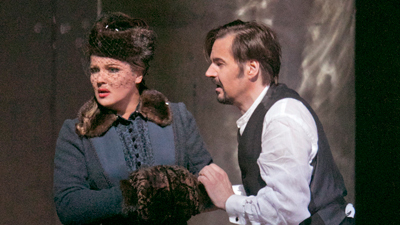 Piotr Beczała is Lenski, the friend-turned-rival Onegin kills in a duel. Oksana Volkova (Olga), Elena Zaremba (Madame Larina), and Alexei Tanovitski (Prince Gremin) co-star, with Russian maestro Valery Gergiev conducting.